Kevin Duane “Yogi” Ferrell Jr. is an American basketball player born in Greenfield, Indiana that played for Indiana University. Yogi Ferrell played the point guard for the Hoosiers for four seasons between 2012 and 2016. The Indiana native was recruited by Tom Crean and played at Park Tudor High School in Indianapolis, Indiana. Yogi Ferrell was one of the top point guards of the Tom Crean era and was ranked as the number one player in the class as a fifth grader. Yogi Ferrell was a 2012 McDonald’s All-American player and he was a two time First-team All Big Ten player in 2015 and 2016. After going undrafted, Yogi Ferrell got signed by the Brooklyn Nets, spent time with the Dallas Mavericks, and now plays for the Sacramento Kings. Name: Kevin Duane “Yogi” Ferrell Jr.
Yogi Ferrell was a 5-star PG recruit from Park Tudor High School in Indianapolis, Indiana. The 6’0″ guard was ranked 21st in the 247Sports composite rankings. He was the third ranked point guard in the 2012 class and the third ranked player in Indiana behind Michigan commit Glenn Robinson and Michigan State commit Gary Harris. In the 2012 McDonald’s All-American game, Yogi Ferrell lead the West team to a victory and had 8 assists without a single turnover. In high school, Yogi Ferrell led Park Tudor teams as the primary floor general and lead facilitator. He was known for his impressive ball handling abilities starting at a young age and played with a maturity to take care of the ball. Yogi Ferrell had relatively good strength given his size and had an ability to get to the rim. As he would do later in his Indiana career, Yogi’s primary way of tallying assists starts with a penetration to the hoop and then a kick out to an open teammate. He committed to play Indiana University on November 24th, 2008. He was recruited by primary by Indiana assistant coach Tim Buckley as well as Indiana head coach Tom Crean. On November 26th, 2010, Yogi Ferrell signed his national letter of intent to play for Tom Crean and the Hoosiers. Yogi Ferrell joined the Indiana Hoosiers in 2012. The season prior, Indiana finished with 27 wins including their well-documented victory over the Kentucky Wildcats. Return players included NBA prospects Cody Zeller and Victor Oladipo. Additionally Christian Watford, Will Sheehey, and Jordan Hulls all added to the depth of a preseason ranked number one team. Yogi Ferrell was expected to be a key piece in a deep tournament run by the Indiana Hoosiers. The 2012 recruiting class was also self-proclaimed as “The Movement.” The term originally was coined by Indiana recruit Ron Patterson who actually never played for the Hoosiers due to issues concerning his grades. The rest of the class included in-state players Jeremy Hollowell from Lawrence Central High School (Indianapolis, Indiana) and Hanner Mosquera-Perea, Colombian native who was playing basketball at La Lumiere School in La Porte, Indiana. Peter Jurkin was the final piece of the 2012 recruiting a class for the Hoosiers. Everyone but Yogi Ferrell would end up transferring to different programs outside of Indiana. During his freshman year, Yogi started as the point guard for the Indiana Hoosiers. His ability to pass combined with his ability to dribble penetrate enabled him to command a team. Tom Crean consistently referred to Yogi’s extraordinary maturity, even as a freshman in college. The 2012-2013 Hoosiers won the Big Ten regular season with a record of 29-7 on the season. The Hoosiers qualified for the NCAA tournament as the #1 seed in the East Regional, but they would be upset by Jim Boeheim’s 4th seeded Syracuse team. Ferrell finished the season averaging 7.6 points, 4.1 assists, and 2.8 rebounds in 28.1 minutes per game. He was voted on the Big Ten’s All-Freshmen Team by coaches. Yogi Ferrell’s second year in the collegiate league nearly instantly put Yogi Ferrell in the driver seat for Tom Crean’s team. The team lost Cody Zeller, Victor Oladipo, Jordan Hulls, Christian Watford, Derek Elston, Maurice Creek, and Remy Abell. In their place, the Hoosiers surrounded Yogi Ferrell with five-star McDonald’s All-American Noah Vonleh, four-star Troy Williams, and four-star Luke Fischer. The Hoosiers struggled mightily during that season under the leadership of Yogi Ferrell. While the Hoosiers won the games against weaker opponents, the Hoosiers did not have any quality wins until late in the season. Despite finishing with a 17-15 record, the Hoosiers had victories over #3 Wisconsin, #20 Iowa, and #22 Ohio State. Ferrell started in all 32 games and finished with 17.3 points per game across all games. He also led the Big Ten in three point field goals made per game at 2.8. Yogi also improved his assists and rebound numbers to 3.9 and 3.0 respectively. The Hoosiers were not invited to the NIT and they declined an invitation to the College Basketball Invitational, also known as the CBI. After another year later, Indiana’s roster turnover continued to be a concern. Noah Vonleh went in to the NBA lottery and got drafted 9th overall. Will Sheehey, Evan Gordon, and Austin Etherington graduated from IU. Wisconsin native Luke Fischer transferred back to the state Wisconsin citing homesickness as his reason. He would then go on and play for Marquette. Jeremy Hollowell and Peter Jurkin transferred out of the Indiana program to Georgia State and East Tennessee State. Without front court players like Noah Vonleh, Luke Fischer, and even Peter Jurkin, the 2014-2015 Hoosiers needed to play “small ball” lineups that heavily favored guard play. Tom Crean cited his intention to watch more European league film as that is how teams in Europe typically play. The guard heavy Indiana squad actually had reasonable success during the season. They had enough success to earn themselves a bid in the 2015 NCAA tournament; however, they lost first round to number 14 Wichita State. While the team had two disappointing back to back years, the Hoosiers were trending upward considering the roster turnover and all of the schematic adjustments the team needed to play. For Yogi’s junior year, he played fairly well considering the circumstances. One thing that Indiana fans learned quickly was that Yogi Ferrell would not fight for his primary ball handling role. Additionally Robert Johnson played more of a combo guard position rather than a true point guard role. In this system, Yogi Ferrell averaged 34.9 minutes per game, which reached an all time career high. He finished the season starting 34-of-34 games and he averaged 16.3 points per game doing so. He paired that with 5.2 assists per game in conference games, which led the Big Ten. Yogi Ferrell announced in April of 2015 that he would be return back to Indiana University for his final year. The news came as a big relief for Indiana fans as there were no other true point guards on the roster. Yogi Ferrell would retain the role as the team captain. As a senior, he also introduced Tom Crean’s schemes and basketball concepts to the younger class. Yogi Ferrell was known to improve his vocal coaching ability while playing on the court. In many games, Yogi Ferrell directed traffic on the floor while playing himself. Although the Hoosiers played with Yogi as the only true point guard, the team also brought in three forwards in the 2015 Indiana Basketball recruiting class. The class included five-star center Thomas Bryant, four-star forward Juwan Morgan, and four-star forward OG Anunoby. Later on, the three players in this class could arguably be one of the best recruiting classes that Indiana has had in retrospect. During the 2015-2016 season, the Hoosiers had a rough early start in the non-conference schedule. While playing in the Maui Invitation in Maui, Hawaii, the Hoosiers lost two games where they were upset by Wake Forest and UNLV. The Hoosiers would then only lose to Duke in the non-conference schedule. The Hoosiers finished with a final 27-8 record and ended up winning the Big Ten conference regular season title. Indiana won 15-of-18 in Big Ten, finishing with a final record of 15-3 in conference play. In the AP poll, they were ranked as high as 10 going in to the NCAA tournament. Their season earned the Hoosiers a fifth place seed in the East Region of the NCAA tournament, which many believed to be under-ranked. After defeating Kentucky in the second round of the NCAA tournament, the Hoosiers then lost to number three seeded North Carolina Tar Heels in the Wells Fargo Center (Philadelphia, PA). Yogi Ferrell’s career at Indiana University had successful “book ends” as a freshman and then as a senior. In both of those seasons, Yogi Ferrell’s team won the Big Ten regular season and advanced to the NCAA Sweet Sixteen. As a prolific passer and shooter, Ferrell’s abilities on the floor would be greatly missed as Indiana followed up with an NIT first round exit the next year. Without a true point guard and the departure of many key players, the Hoosiers struggled to retain any consistency from the year prior. Shortly thereafter, Tom Crean was fired from his position as the head coach of Indiana University and he was replaced by Dayton’s Archie Miller. Although Yogi Ferrell played for coach Michael Hasch during his freshman year at Park Tudor, he primarily played for coach Ed Schilling after Schilling took over the role in the summer of 2009. Ed Schilling would go on to join Archie Miller’s staff in 2017. Yogi Ferrell under the coaching of Ed Schilling would have a great high school career at Park Tudor, making it to the state finals during his sophomore, junior, and senior years of high school. As a freshman Yogi Ferrell played under then head coach Michael Hasch. Park Tudor advanced in the first round of the Class 2A sections defeating Heritage Christian; however, they would then subsequently lose to Cardinal Ritter High School. During his sophomore campaign and first year under newly minted head coach Ed Schilling, Yogi Ferrell led Park Tudor to the IHSAA Class 2A state finals. After being only 14-10 going in to Regionals, Park Tudor won games against South Bend Ripley, Winchester, and Forest Park, earning them a spot in the Class 2A State Finals game against Wheeler. Park Tudor would then lose a heart breaking 4OT game 45-47 to Wheeler High School. As a junior, Yogi led Park Tudor High School to a 26-2 record. During his junior year, Trevon Bluiett was a notable addition to the Park Tudor Panther roster. Trevon Bluiett himself would have a success college career playing for Chris Mack at Xavier. Under the leadership of Yogi Ferrell, Park Tudor won the IHSAA Class 2A state title in 2010, defeating Hammond Bishop Noll with a final score of 43-42. Hammond Bishop Noll went into the Class 2A state title game undefeated at 26-0. Yogi Ferrell finished his senior year at Park Tudor averaging 18.5 points per game and led his team to a IHSAA Class 2A state title. In the championship game, Yogi Ferrell had 12 assists, 17 points, and 9 rebounds. He barely missed a triple-double performance, but he did set a championship record with his 12 assists. Park Tudor High School would blow out Bowman Academy in the championship game with a winning margin of 22 points – the state finals game ended with a final score of 79-57 in Conseco Fieldhouse. After graduating from Indiana University in 2016, Yogi Ferrell went undrafted in the 2016 NBA draft; however, Yogi quickly found a summer league team which he joined. He played for the Brooklyn Nets in the 2016 Summer League where he averaged 8.8 points and 1.8 assists in 4 games. Yogi Ferrell signed a non-guaranteed contract with the Nets in August of 2016 and played in three preseason games; however he was quickly waived. In those three pre-season games, Yogi averaged 4.3 points per game and 1.7 assists per game. Yogi Ferrell still received a $100,000 guaranteed portion of the original contract. Yogi would remain with the Nets organization and signed with the affiliated Long Island Nets D-League (NBA Development League) on November 1st, 2016. Ferrell then rejoined the Brooklyn Nets on November 9th and recorded his first ever career NBA game where he had 5 points, 3 assists, 1 rebound, and 1 steal in 14 minutes of play. The Brooklyn Nets would eventually lose to the New York Knicks. Upon the clearing of fellow Big Ten player and NBA rookie Caris LeVert, Yogi Ferrell was then waived a second time by the Brooklyn Nets after a 10-game stretch. On December 10th of 2016, the Long Island Nets would pick up Yogi Ferrell and continue to use him as a starting point guard in the NBA’s development league. Brooklyn elected to go with Spencer Dinwiddie, a combo guard that played both the point guard and shooting guard position. Yogi Ferrell would finish the season with the Long Island Nets and he managed to earn himself a roster spot on the NBA D-League All Stars. His final statistics across 18 total games for the Long Island Nets included an average of 18.7 points per game, 5.8 assists per game, and 2.9 rebounds per game. He shot nearly 40% from the three point arc and over 90% from the free throw line. At this point, Yogi Ferrell had to make tough decisions. He was getting a number of phone calls from European leagues where they could offer him a lucrative contract given his circumstances. Yogi Ferrell had worked out for a number of NBA teams, but none of them seemed to show prolonged interest in the relatively undersized point guard out of Indiana. Yogi Ferrell elected to chase his dream of playing in the NBA and ultimately stayed in the United States. He passed on offers to play in the Euroleague. In January 2017, he eventually received a call from Dallas Mavericks’ general manager Donnie Nelson. He offered Yogi Ferrell a 10-day contract to play for the Dallas Mavericks. Dallas Guards JJ Barea was out due to a left calf injury and Deron Williams was out due to a toe injury. Many believe that owner and Indiana alumnus Mark Cuban was deciding between three guards and went with Yogi Ferrell by choosing a player from his alma mater. Yogi Ferrell would go on to have one of the best performances on a 10-day contract in NBA history. Even the term “Yogi-Mania” was coined during this time period as Yogi Ferrell maximized his opportunities as a starting guard for the Mavericks. After a couple of sessions with head coach Rick Carlisle, Yogi Ferrell learned and picked up about 20 of the Mavericks offensive sets in short order. He was immediately introduced into the starting line up and played against veteran Hall of Famer Tony Parker and the San Antonio Spurs in Yogi’s first game with the Dallas Mavericks. Behind Yogi’s 9 points and 7 assists in 36 minutes, Dallas won their first game against San Antonio since 2011. Yogi then scored 19 points the next evening against the defending champions Cleveland Cavaliers and held Kyrie Irving to just 7 of 21 shooting from the floor. By the end of the week, Yogi Ferrell reached his peak. In fact, the Mavericks originally had the intention of signing Yogi Ferrell to another 10-day contract; however, instead they elected to go with a two-year league minimum contract. That same night, Yogi Ferrell played one of his most impressive career games. He scored 32 points on 9-of-11 shooting from behind the arc against Damian Lillard and the Portland Trailblazers. His 9 three point makes tied the NBA rookie record for most three point shots made in a single game. Additionally he was just the third undrafted rookie in NBA history to have a 30-point game within their first 15 games. For the remainder of his iconic 10-day contract, Yogi Ferrell continued to post impressive numbers against team after team. Yogi Ferrell was named the Western Conference Rookie of the Month on March 2nd, 2018. His performance starting with his 10-day contract earned him a spot on the NBA All-Rookie Second Team. Yogi Ferrell signed with the Sacramento Kings on July 23, 2018. The agreement would be a two-year contract worth $6.2 million. 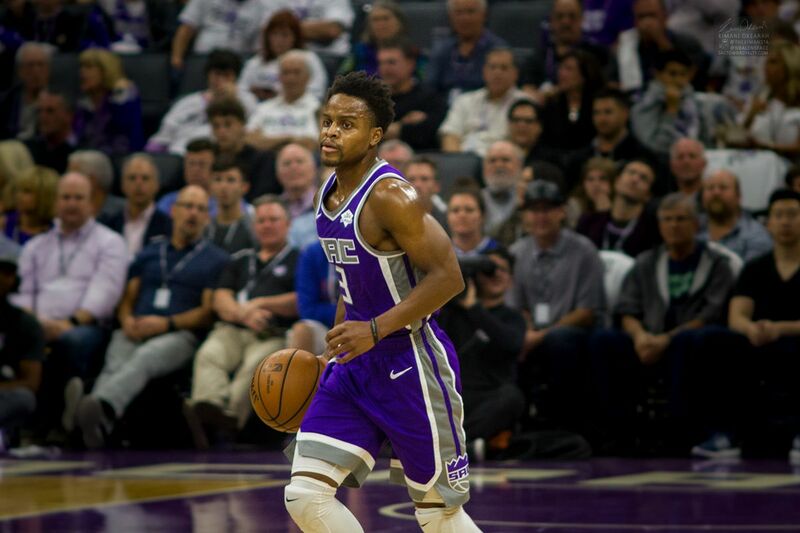 On the Kings roster, Yogi Ferrell has not had the starting role since the Kings have drafted a younger point guard in Kentucky’s De’Aaron Fox; however Yogi Ferrell continued to average over 15 minutes per game over the course of the 2018-2019 season. Going into the contract, Yogi Ferrell knew that he would be a backup on the Kings’ roster.